The de Havilland DH88 was one of many aircraft built during the interwar period solely for racing, and one of the few to gain long-lasting fame. A firm known mainly for light aero club aircraft, the company’s chief designer and founder Geoffrey de Havilland also produced several fighter and bomber designs during the Great War under the auspices of Airco. The DH88 originated following the 1934 announcement of an air race to celebrate the centennial of the city of Melbourne, Australia. Three of the type were built for the so-called MacRobertson Air Race, with the red machine G-ACSS “Grosvenor House” ultimately claiming the £15,000 price with a winning time of 70hr 54min 18sec. Following the race an additional two airframes were built for French interests, after which de Havilland returned to light aircraft and airliner manufacture. The true legacy of the five Comets, beyond their racing and records, was that the plywood construction of the sleek aircraft led to the development of the supremely elegant DH91 Albatross airliner, and ultimately to that jack-of-all-trades, the superlative DH98 Mosquito. Today only the race-winning G-ACSS remains intact, in an airworthy condition but rarely flown, with the Shuttleworth Collection at Old Warden, Bedfordshire, UK. The remains of “Black Magic” G-ACSP are the basis of a long-term restoration project, whilst an airworthy replica resides in the USA and another under construction in New Zealand. This kit is a Novo reissue of the original FROG kit, also market in the USA by Lines Brothers/Air Lines, and as such is not new. However despite its age it is commendably free of flash (except for some present on the propellers) and prominent ejector pin marks, these being confined to the inner surfaces of the wings. On my copy I could only find one sink mark, this being on a nacelle half. Surface detail is raised and restrained on the fuselage. The sparse lines on the aircraft, when compared with photographs of G-ACSS, appear to be correct. The trailing edges of the wings and the control surfaces all have raised lines to represent fabric detail, which will need to be sanded off by the builder concerned with total accuracy. The interior is also, typical of a kit this vintage, very sparse – two seats, and pilots to place on them. The cockpit opening is very small, but the enterprising builder can add sidewall detail and instrument panel. I believe there is a complete aftermarket resin ‘pit available, for those who want to go all out. The canopy is, however, moulded as one piece, so careful cutting will be needed to have it open. The canopy is commendably thin, but perhaps too streamlined: compared with photos of the real thing, it is shallow and altogether too curved. The undercarriage is fiddly enough to keep you busy, but appears to be a faithful representation, down to the stylish wheel fairings. The instructions give you the option to have retracted gear, and a recess is thoughtfully provided under the wing for this. The horizontal stabilisers are moulded in halves, which will mean substantial sanding to obtain the correct thickness (this would also mean sanding the elevators, so you may choose to leave them be). The props, although finely moulded, appear too paddle-like and may need replacement. The nacelles are incorrectly moulded with the intake central, rather than offset to port as on the real machine. Smaller components, such as exhausts, mass balances and pitot tube, are not included, but the landing light on the nose is shown with a clear piece. Finally, two standing pilot figures (representing Tom Campbell-Black and Charles Scott, 1934 race-winning crew of ‘CSS) slightly larger than 1:72 are provided. These are very nicely done, right down to the moustache and necktie on one. Decals in my copy appear very nice but thick, proving race number, registrations, name and the fuselage cheat line. However I have my doubts as to how well mine have aged, so I may track down an aftermarket set or make do with my own. Due to the fact that they’re almost entirely white, and the yellowing, I decided not to include an image of them for this preview. 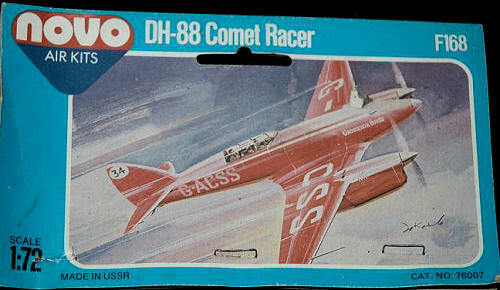 This is one of two 1/72 injection-moulded Comet kits available over the years, the other being Airfix’s veteran 1:72 kit. The Airfix issue is a fairly nice kit, but I believe the Novo one walks right over it. 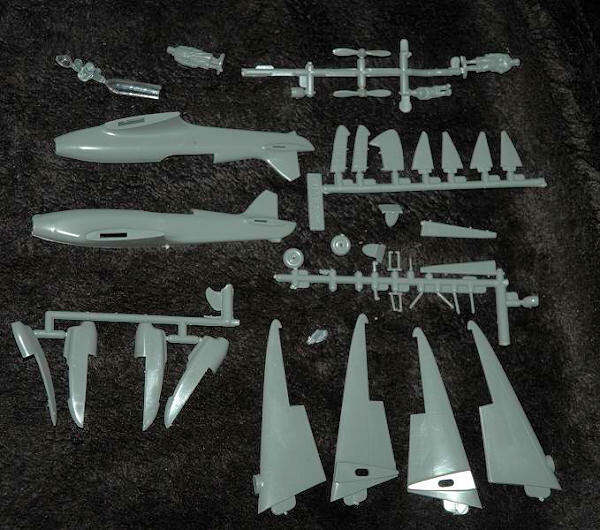 The Airfix kit has a thick canopy, non-existent interior (two head shapes are instead moulded on the fuselage halves), large wing-fuselage seams which are awkward to fix, and no clear landing light. It does, however, correctly have the offset intakes. The Novo kit overall gives the impression of needed less work to be done right, with the major faults being the shallow canopy and central nacelle intakes. The canopy area lets the kit down, but with a replacement canopy – if available – and some cutting, it provides no major obstacle. Overall I’d recommend the FROG/Air Lines/Novo Comet, which pops up from time to time on eBay.